QR Codes on store displays have been proven to enrich the consumer shopping experience while boosting sales. More and more retailers are taking advantage of this valuable marketing tool. Effective QR Codes on displays positively engage customers at the moment of making a buying decision while actively bringing social networking and entertainment into the shopping arena. Successful Codes harness the ability of consumers to research products and pricing while actively encouraging them into high-street stores. As well as benefiting from increased sales, as a retailer, you can also use these scannable Codes for keeping track of sales and for gaining access to customer contact details. Read on for suggestions on where QR Codes can be used on your displays. The use of Codes in your window display totally transforms the concept of “window shopping”. They give customers instant access to a huge amount of product information that can range from reviews and styling advice to finding out about related products. They can even extend the shopping day as when your store is closed, consumers can simply scan and buy. High-end design stores such as Ted Baker and Kate Spade were among the earliest users of QR Codes in their display windows, a fashion that has now reached many mainstream retailers. Point of sale and checkout displays have always been a successful way of pushing impulse purchases. When QR Codes are added to your point of sale displays they instantly become more seductive to customers. The Codes are valuable interactive tools for showcasing your store's special offers and new product arrivals. Alongside the QR Code, a clear call to action using a Frame should be displayed, indicating whether scanning the Code leads to product information, free samples, discounts or a competition entry. The careful placement of floor standups featuring QR Codes can highlight your seasonal promotions and special offers while giving instant fashion styling advice. For example, scanning the Image Gallery QR Code can give images of a selected item such as a dress that has been styled and accessorized in different ways. Such creative floor standups are a proven way of driving further purchases. Pop up displays with QR Codes can increase consumer interaction with and awareness of your brand by linking a product to visual promotional campaigns. Prospective buyers can see the product, whether it's clothing, homeware or food, being styled or used in creative ways. This instantly alerts them to the product's potential as well as subtly suggesting related products they might wish to purchase. Large LED display screens in your store, a shopping mall or public arena are a great way of advertising your product in an interactive manner that is guaranteed to attract attention. As the QR Code has now become part of a moving image you will need to ensure the LCD or LED screen is of the highest quality possible with an optimal refresh rate and minimal light distortion, both factors that can affect successful Code scanning. Using QR Codes on trade show displays immediately increases the size, scope, and potential value of your exhibition space. They show potential consumers that you are on top of the marketing game while providing an interactive experience for your stand visitors and potential customers. Whether they are linking to a competition entry, offering the chance of valuable discounts with a Coupon QR Code or simply providing a way of connecting with clients in the future, QR Codes are a tried-and-tested way of converting interest into sales. Hopefully, we've given you some ideas for exploring the full potential of QR Codes on your display stands. For further inspiration, visit QR Codes for every purpose at our website for further retail display suggestions. QR Codes on displays need to be clearly visible from a distance, featuring bold and readable fonts that stand out from their surroundings. Provide the necessary information with small chunks of text and position the QR Codes where they can be easily accessed by smartphones and mobile devices. Customize colors and fonts to match your brand while providing a clear contrast between foreground and background with a bold border. When designing QR Codes for LCD or LED display stands the design of the border and ensuring enough color contrast between the Code's design and the background become even more important. The right design is a guaranteed way of generating more sales for your product. Once your Code is designed, check its functionality across a range of mobile devices before committing to a print run. For more advice, visit our website and read how to get creative with QR Code design. 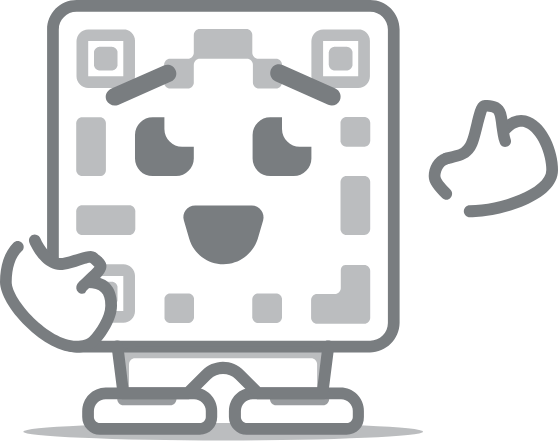 On our features page we help you design, customize and print your QR Codes. Once you're happy with the design, you'll find we have file formats for printing jobs of all sizes. The matt surface of display banners is perfect for QR Code printing as it doesn't create reflections and light distortions. To ensure the perfect outcome, we suggest you read our top 10 tips for printing QR Codes.